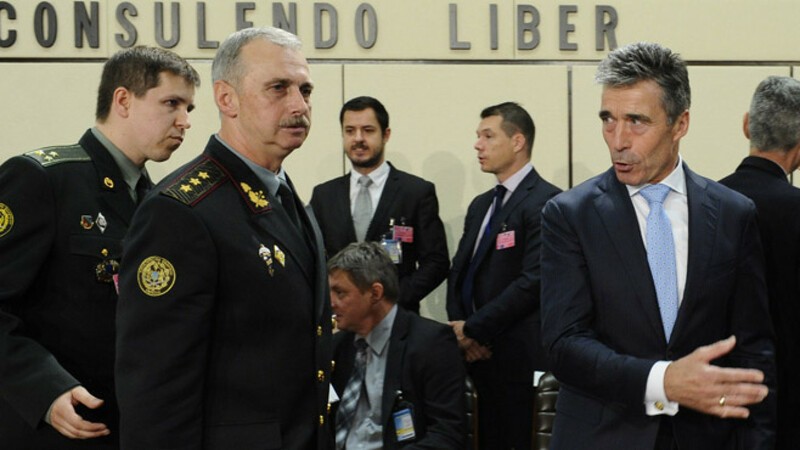 Ukraine Defense Minister Mykhailo Koval talking with NATO’s Rasmussen. "We need to make NATO fitter, faster and more flexible," the alliance's secretary-general, Anders Fogh Rasmussen, told reporters as the meeting opened. "All this could cast Europe back to the days of the Cold War and launch an arms race," Russian Ambassador Alexander Grushko said, Interfax reported. NATO officials said actual decisions will likely have to wait for the alliance heads of state and government meeting in September. To prepare for the summit, the ministers are also scheduled to discuss defense spending and the future of Afghanistan following the end of NATO-led military operations this December. Defense Secretary Chuck Hagel is attending the meeting for the U.S.